Categories are the road signs that help your readers find topics on your website that are of interest to them. A category is a group of posts which have a broad topic in common. This website is devoted to how you can make money working from home by using a WordPress website combined with Affiliate Marketing. Therefore the two main categories on this website are WordPress and Affiliate Marketing. Categories are relevant to several posts on your website whereas Tags are relevant to an individual post. More on Tags later. If your website is about cats then your categories could include Kittens, Mature Cats, Older Cats, Health Issues, Behavior Problems etc. Then you would write each of your posts with the chosen categories in mind. Your post about health issues in older cats could appear in both Health Issues and Older Cats. If it’s about a health issue that can affect cats of every age then you would put it into all the age appropriate categories. So it would appear in Health Issues, Kittens, Mature Cats and Older Cats but not in Behavior Problems. You don’t need lots of categories. See if the article you’re writing will fit into one of your previously defined categories. Try to keep the number of categories manageable so they fit comfortably into your website’s menu. And one or two words is usually enough to define each category. One of the first things you’ll want to do as you’re building out your website is to remove the category ‘Uncategorized’. You’ll need to replace it with another default category. On this website, I have made the default category ‘WordPress’. On the cat website, you could make your default category ‘Health Issues’. For your default category try to choose a broad topic that you intend to write a lot of posts about. In other words, your ‘niche’. Your ‘Cat’ niche is probably not so much about cats in general but how you can help cat owners solve problems with their cats. If you’re really stuck for a name for your default category then call it “General”. When you are writing a post in edit mode you’ll see Categories in the right-hand column when you’re using the Document tab. Underneath any existing categories, you’ll see ‘+ Add New Category’. This is the quickest and easiest way to add a new category. Click on the link and type in the name of your new category. Then you can either hit the ‘Enter’ key on your keyboard or click on the ‘Add New Category’ button. The current post will be automatically assigned to the new category you’ve just created. Each main category can have many child categories. Of course, in WordPress, each category can only have one parent category. This feature is optional, if it suits your website use it, if not just keep them as top level categories or you can mix it up. Not all main categories need to have child categories. Under my ‘WordPress’ category I have several child categories. You can see the categories and child categories in this website’s menu under “Blog”. Click on ‘WordPress’ or ‘Affiliate Marketing’ in my menu under “Blog” and you’ll get excerpts of all the posts using ‘WordPress’ or ‘Affiliate Marketing’ as one of the chosen categories. As with your blogroll, the excerpts for categories appear in chronological order and may get spread out over a number of pages. 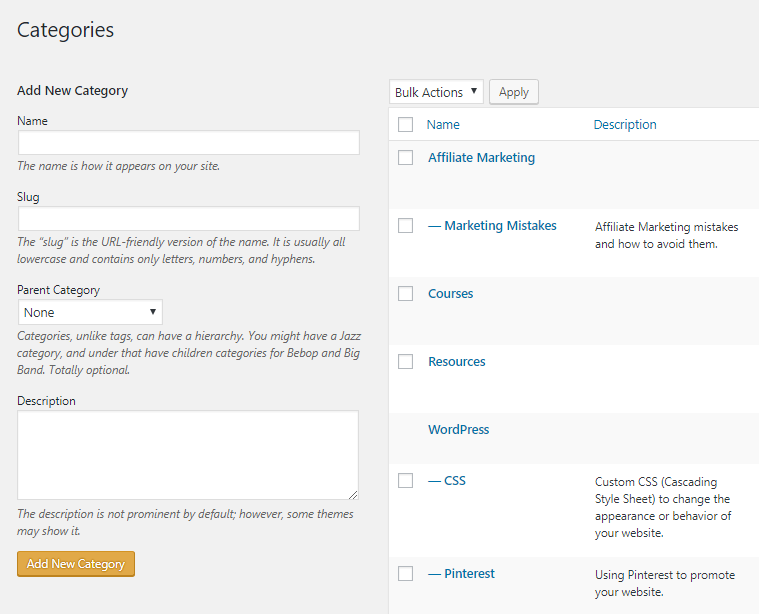 You can access existing categories via your WordPress dashboard menu. Hover your mouse over ‘Posts’ and click on ‘Categories’. This is where you can remove any unwanted category, edit or change the name of an existing category and add descriptions. Make sure you’ve set a broad category that suits your main content as your default category before you delete ‘Uncategorized’. Think of tags as alternative titles to your post and subheadings. For each tag use one or two words or a very short phrase. It may be a good idea to use some of your subheadings as tags. Tags help internet surfers find your post when they are looking for a topic that interests them or an article that provides a solution to their problem. So tags help people find your article on the internet (and if you use a search box on your site) and categories also help people who are already on your website find other articles they may find interesting. You can use multiple tags on each post and you can use the same tag on more than one post whenever it’s appropriate. 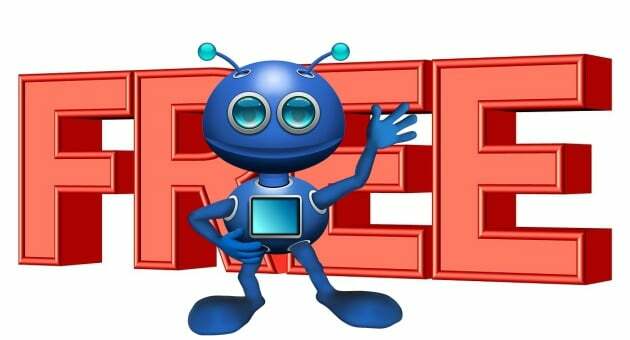 Try to use at least two tags for every post, they will help your posts get found on the internet. If you don’t want to put your categories into your main menu you can use a Category widget in your sidebar. You can make this into a dropdown list to save space. There’s also an option to add a Tag Cloud widget. Personally I find it a bit distracting so I don’t use it myself. I’ve also read somewhere that because it’s generated as the page loads it could slow down your website’s loading speed. Are you making good use of categories and tags? I know this might sound like a dumb questions but can I completely remove it and not have anything showing there? Posts are meant to have categories. They make it easier for people to navigate around your website. If you don’t want to use categories then you can just use pages for all your articles. Thanks for making it clear to me Marion. Your article is very well explained and I am going through your other tutorials as your website seems to be a goldmine of information. I have read your bio, I am really impressed. I look forward to reading more of your articles as they come out. On my WP Dashboard, in the Category menu, my “uncategorized” category does not have delete as an option. What I have been doing is just unchecking it when I write a post and selecting the appropriate categories. Is there a reason I should actually change the uncategorized to something and use it? Or is it Ok to just ignore it? Another question I have is about tags. Is it bad to use related keywords that describe your article, but may not actually appear in your article? WordPress needs you to have a default category. Once you’ve chosen a default category that suits your website make sure you’ve removed “Uncategorized” from every post and you’ll be able to delete it. The simplest way to ensure that none of your posts are “Uncategorized” is to change the name to something else. Yes, you can use related keywords that describe your article even though you don’t use those exact words in your writing. Using tags helps to tell the search engines what your post is about. This article, People are Looking for Answers Not Questions explains more on that subject. Thank you for your help! I just fixed my “uncategorized” category. Now I am off to read your People are Looking For Answers article. Can’t wait to see what insights you have on that topic. Thanks Marion for the great information. Categories are part of a website that sometimes gets overlooked or not used correctly, particularly with those new to WordPress. The correct use of categories is extremely important in providing a good user experience. Those who read your post will have great advantage over those don’t get to read it. You have so clearly explained the process. Also you have taught me how to change the name of a category. I didn’t think it was possible to do that. So now I can happily change ‘Uncategorized’ to an appropriate name. Thank you. Thanks for the simple explanations! This post comes right on time for me. I have been trying to sort out categories for a while. It seems easy when using some themes, but others seem not so easy. Does what you have said apply to all WordPress themes? Categories are part of the WordPress core so it should not make any difference which theme you are using for your website. How many categories you need will depend on your niche. Another great resource, Marion. Thank you! Categories, Tags, keywords, hashtags, all these concepts have always been very confusing for me and I used them, let’s say, “intuitively”. One of your sentences here hit home for me now: “So tags help people find your article on the internet and categories help people who are already on your website find other articles they may find interesting.” THings are now cleareer for me and I can use these concepts by knowing what I am doing. Thanks to you! I’m glad that helped to clarify things for you Heidi. It took me quite a while to figure out what hashtags are and when to use them. It’s all quite a learning experience. Absolutely, Marion! Sometimes quite frustrating and overwhelming, but after every learning step also very inspiring and empowering! A very clear explanation of the roles “categories” and “tags” play on your WordPress site and how they help to get your content noticed online. Good advice about setting them up correctly too. Thanks Paul, I appreciate you stopping by. Being a relative newcomer to WordPress I have read-up a lot. This is the best, plain English, explanation I have come across on these topics. I only wish I had come across this post and web site before now. Thanks Chris, keep coming back as I’ll be adding more great information for you. This was a great article Marion. I learned so much from reading. I have had these questions about Categories and Tags for quite sometime, and have been unable to get a definitive answer, until now. Thank you so much!! We all start at the very beginning Tammi. As you get more experience you’ll become more confident in what you’re doing. I found your article very helpful and it has answered me a couple of questions I already had. Recently I wanted to eliminate a category by creating a new and better-suited one but to change my posts into the new category I was a bit uneasy to delete the old category because I might lose all my posts. But of course, this isn’t true. Yes, editing the category is much easier than going through all your posts and individually changing the category. Thanks for the great post. I knew what categories are, and I think I knew what tags are. Actually, now I know what tags are for. Unfortunately, I never used tags! I didn’t know that tag can help the user to find my article. One question, if I put tags now on posts that are published months and years ago, would it benefit or hurt my site? Also, if I put a post under two categories, is it ok for big G? Absolutely, Nenad. It’s worth spending the time to add tags to your old posts, it will give them a new lease of life. While you’re doing that you could have a look to see if the post needs updating or improving. If you do update remember to change the published date so people will know it’s fresh content. I usually have more than one category for each post, it just depends on the subject and it makes the post easier to find for your website visitors. This is a great imformative post. I had no idea how to change the ‘uncategorized’ and you have clearly shown the process. Thank you so much. I had already worked out the Tags but categories was a challenge. Selling online is a complicated subject I find and thanks to Wealthy Affiliate their teaching program is second to none! I like this information on categories and tags. Actually you broke it down very well. I think many time bloggers have entirely too many categories when actually they already have a category that fits that particular blog post. Thanks for sharing about how to remove the default category that comes with wordpress. That is a gem that a lot of people need to know how to do. I like your illustration of tags as well. You are correct that tags actually help people to find your articles so it is important to be creative with your tags.